I'm sure some of you are all wondering how I came up with the name for my blog and my Etsy Shop, right? Well, I am more than happy to tell you. My hometown is a small agriculture community in north central Iowa by the name of Iowa Falls. It was a great place to grow up back in the 50s and 60s. One of my favorite memories, although a vague one, is of a restaurant once located on Highway 65 on the south side of Iowa Falls. I don’t remember ever being inside it but I do remember it. This restaurant was shaped in the form of a coffee pot. Yes, that’s right, a coffee pot. So unique but unfortunately, torn down many years ago. What a shame! While taking a writing course, the idea dawned to write a mystery series. Two favorite authors are Dee Henderson and Terri Blackstock who both write series. I pondered a name for the series but it wasn’t until I came across an old photo, given to my dad, that the light bulb went off and “The Coffee Pot Mystery Series” was born. I have two novels started with titles and ideas for two others. The series is based on my hometown and, yes, you guessed it, the restaurant shaped like a coffee pot. Below is the picture given to Dad that will soon find its way onto a canvas to hang on my wall as continued inspiration. While I am still writing and working on the novels, my love for paper crafting has taken center stage through my Stampin’ Up! business. I love creating new cards and projects and teaching others. 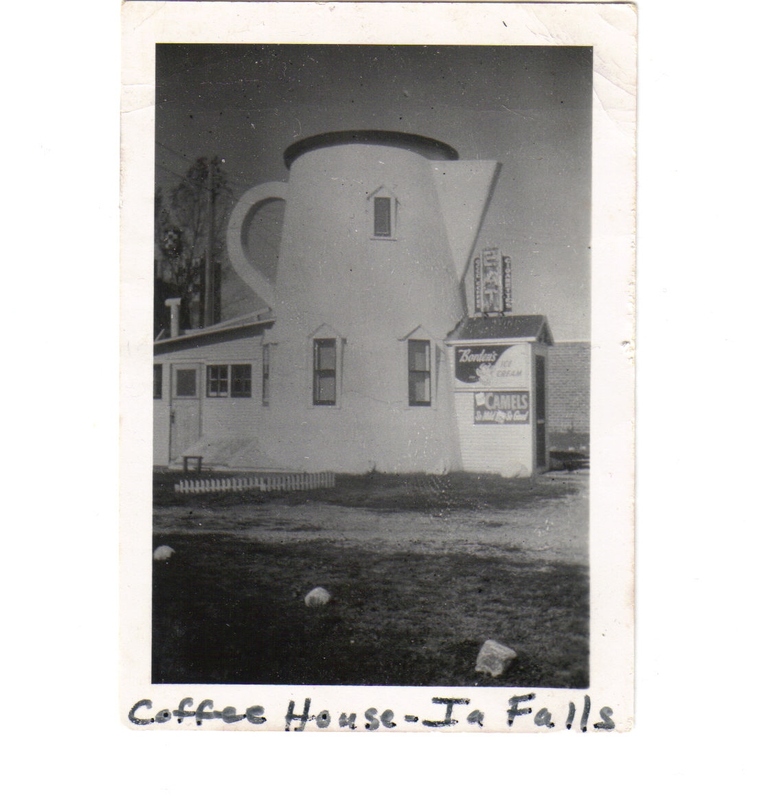 So, there you have the story behind Marsha’s Coffee Pot Café. Of course, my love of coffee played a role as well. There is nothing like the fragrance of a freshly brewed pot of coffee! Wow Marsha...thanks for sharing the story behind the name. I love those vintage style buildings...I'd love to convert one to a home but sadly so many of them are gone now. What a terrific inspiration for a mystery series too. And writing after all is just another papercraft...right? So I'm guessing you have the Morning Cup stamp set to work with right or is that carrying things just a little too far? LOL. Loving the blog and following you now.